WSM :: The magazine site with all stories, reviews, web exclusives, and galleries. Discovery :: A commentary chronicling the creative and intellectual excitement of discovery at WSU. Our Story :: An evolving, informal history written by alumni, faculty and friends of WSU. My Story/Class Notes :: A place for WSU alums to post updates, photos and other content about their lives. Also read featured notes about Cougs' accomplishments. Coordinates :: Dispatches from WSU family around world, featuring interactive maps. You can visit each section through the WSM home page. WSU research news is available on the right of the home page, and the latest WSU news headlines are at the bottom of the home page. In each section of the WSM site, you can find a navigation bar that will take you to WSM, Discovery, Our Story, Coordinates, or My Story. You can also search or reach the help menu through that bar. On most pages, you can find tools at the upper right of the content section. These tools help you e-mail stories, share or bookmark content, print pages, and make text larger. Watch the print magazine for updates in Discovery, Our Story or Coordinates. Several tools can help you navigate the WSM magazine site. To navigate the current issue of Washington State Magazine from WSM home, click on the links at the top of the page, a photo that catches your interest in the slideshow, or to stories directly through a dropdown table of contents below the issue cover image. Click on the small "[+] In this Issue" to see the table of contents. On an issue table of contents page, click on an article or web exclusive's title to go directly to that page. You can click on the magazine cover image to view a larger version of the magazine's cover. The PDF link on the magazine issue's table of contents links to an enhanced PDF, which allows you to view the magazine in full-screen mode. On each article and web exclusive page, you can navigate back to the table of contents through a dropdown menu on the upper left. Click on "[+] In this issue" to access that issue's table of contents. Most articles have images in a mini-slideshow on the right side of the article. Click the arrows to browse the images. Many images also have larger versions, indicated by a [+] by the right bottom corner of the show, available if you click on an image. On the left side of every page is a navigation menu to various sections of the website. Social network links are at the bottom of each page. Discovery is a blog, with regular posts on intellectual work and research at WSU. You can read the first part of the latest posts on the home page, and click on the title for the full stories. On the sidebar, you can navigate to older posts by date or category, or search for keywords. Discovery runs on the WordPress blog system. You can find out more at the WordPress website. Our Story is a "wiki," with the ability for Cougar alums, faculty, and friends to contribute stories, pictures, or videos of their time at WSU. Write stories and gather photos. Post the photos and the stories at Our Story. Categories, portal pages, and the ability to contribute to others' articles. You can read much more on the Our Story help pages. 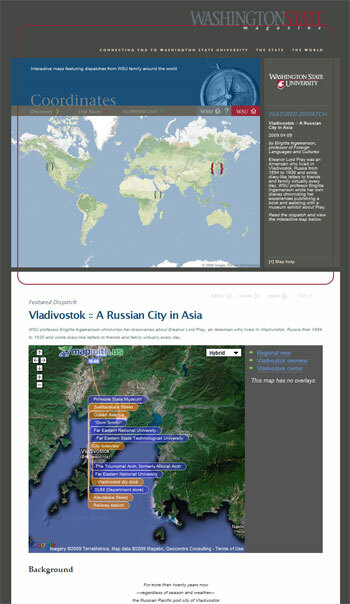 Coordinates contains dispatches from Cougs around the world, using interactive maps containing photos, links, articles and video. Coordinates dispatches can be located on the world map at the top of each Coordinates page. If you hover over the bracket markers (crimson for feature, gray for older dispatches), you can read a brief description of each dispatch. On the dispatch pages, you can read the text below the map. The interactive map contains "tags" that are blue or orange. Click on them to show photo galleries, web links, or other material associated with that location. Some maps have other views, which will appear on the right side of the map. Click on the view links to see a different aspect of the location. At the bottom of each dispatch is an archive of older dispatches. On the right, top sidebar of each Coordinates page is a dropdown "[+] Map help" that can guide you further. Coordinates is powered by MapWithUs developed by students and faculty at WSU Vancouver.